The benefits and negatives of using both essential oils and herbs is discussed in this article. I hope it answers your questions about which are better: Herbs? Or essential oils? The question I am answering in this post (Which are Better? Herbs or Essential Oils?) may be a bit inflammatory, but please hear me out. I've been asked this question many times in the past few years. And, this article has actually been sitting in my "draft" folder for over a year now! What spurred me to get it done is a friend of mine told me that a distributor in one of the big MLM essential oil companies recently stated very publicly that essential oils are "better" than herbs. I finally felt the need to answer this question, "Are herbs or essential oils better?" Before I start, I just want to say that herbs and essential oils are very different, and therefore serve some quite different healing and health uses. And...I happen to use both, depending on what the needs are. First Off. How did I begin my natural health journey? And how serious am I about it? What gives me the experience to even answer this question? About 8 years ago, I was introduced to essential oils via a lady who was peddling the Young Living brand. I fell in love with them! They were just wonderful! But, as a single mom with a very limited income back then, it turned out, they were way too expensive for me (Young Living is an MLM company with high quality essential oils). Fast forward a year. I had begun to get curious about this "natural" health thing, and I had tried a few herbal remedies I found online that really worked great! I also read Rosemary Gladstar's book, Medicinal Herbs: A Beginner's Guide, from start to finish and experimented like a mad-woman with many of the herbal recipes and ideas in her book. I had one SUCCESS after another! Then I took a LONG course---The Science and Art of Herbal Medicine through Rosemary's Sage Mountain School. It was GREAT! Suddenly I was the "community herbalist" in our small village, sharing my tinctures, teas, oils, salves, and yes---essential oils, with friends and family. I continued my herbal studies, switching over to The Herbal Academy of New England, where I enrolled in several courses that fit my needs. They seriously have something for everyone at every level and interest---if you are wanting to learn about herbalism in any form, I think you should take a look at what they offer for learning about using herbs for your health. Meanwhile, I had stopped using essential oils as much, while I focused for many years on using herbs. This was partly due to the cost and partly due to the fact that I was having major successes using herbal preparations. **A side note: In the interim, I had tried the essential oils in the stores---NO way. They are cheaper because honestly, they are not of high quality. There's a good chance they are probably adulterated too. You can read about how to choose a quality essential oil brand that won't break the bank in that link. Then I bungled into doTerra essential oils. Like Young Living, doTerra is also an MLM with high quality essential oils. I signed up to become a distributor (in the spirit of transparency, I still am, although inactive), and I still love their essential oils. At this point, I have been using essential oils and herbs for our health for over eight total years. And I'm proud to say that Mr. V. and I have not had to purchase OTC drugs or use Rx medications in many years--since about 2014. You now have some knowledge about my herbal/essential oil journey so you can understand how and why I feel I can answer the question: Which is better? Essential oils? Or herbs? I use whole herbs, herbal preparations, AND essential oils proudly and boldly. There are some definite pros and cons to using both herbs and essential oils. I am going to try my best to be fair in my answering of this question, "Are essential oils really better than herbs?" And bear in mind: These are my opinions based on many years of using both herbs and essential oils successfully. And, FTC Disclosure: There are affiliate links scattered throughout. If you click through and make any kind of purchase, I may earn a very small commission at no extra cost to you. Herbs contain compounds from the entire useful part of the plant and therefore are able to meet many needs at once. Herbal preparations such as tinctures, teas, salves, infused oils, etc., contain many chemical constituents that work synergistically in the body for healing and health. You can get really creative when using herbs. Besides the typical herbal preparations most herbalists love to use, whole herbs can be slipped into foods, made into healthy drinks (like kombucha, teas, & smoothies), infused in honey and vinegars, and many more. They can be powdered and added to candies, recipes, and all kinds of treats. Trust me when I say that nothing feels more empowering than knowing you can go out and pick your own medicine and create what you need without spending a dime or worrying about toxins. Even when I lived in the Mojave Desert (most of my life), I learned how to use the desert plants to meet many of our medicinal needs. And--I learned to grow so many more of the herbs I used often. You can find out more about foraging medicinal herbs in this article. And you can find out which medicinal herbs to plant in your own garden here. This may sound a little "woo-woo", but follow me here. When you get to know a plant intimately, (like I have learned to love St. John's Wort, lavender, usnea, yarrow, chamomile, calendula, and so many, many more) you develop an intuitive ability to know what that plant can heal. What ailments it can help soothe. And in what ways it best works for you. Essential oil usage is actually relatively new to the plant medicine scene. Using herbs for healing, on the other hand, has occurred in every culture of the world, for thousands of years. Ongoing research on many herbs has been conducted for decades, and more and more clinical evidence is being found every day in favor of the use of herbs for health. Essential oils are also being researched, however, herbalism has a much longer tradition of use all over the world. This is a very controversial topic, as there are some who vehemently believe essential oils are perfectly safe to use internally. However, although there are a few herbs, such as wintergreen and arnica for example, that should not be taken internally, there are many hundreds more that when used within therapeutic boundaries, are exceptionally safe to use and aren't going to eat into your gut or esophageal lining. Herbs and essential oils are both excellent healing helpers. Unless you purchase your herbal preparations, they do take time to create. A tincture, for example, can take up to six weeks to make and be ready for use. Even a tea takes around 20-30 minutes to infuse, which one can argue is not that long. But still. A half hour is a half hour. However, once you have that tincture or oxymel or syrup created---you have it sometimes for many years. So even though this is a downside, it's not major in my book. You can find out How to Make an Herbal Tincture and How to Make an Herbal (Tea) Infusion in these articles. If you are using herbs for medicinal purposes, I'll be honest. Sometimes they can just taste downright bad. Sometimes they don't, though. And although there are ways to help tinctures and teas taste better, often there is not a lot you can do. Using herbs is very often an acquired taste and action. 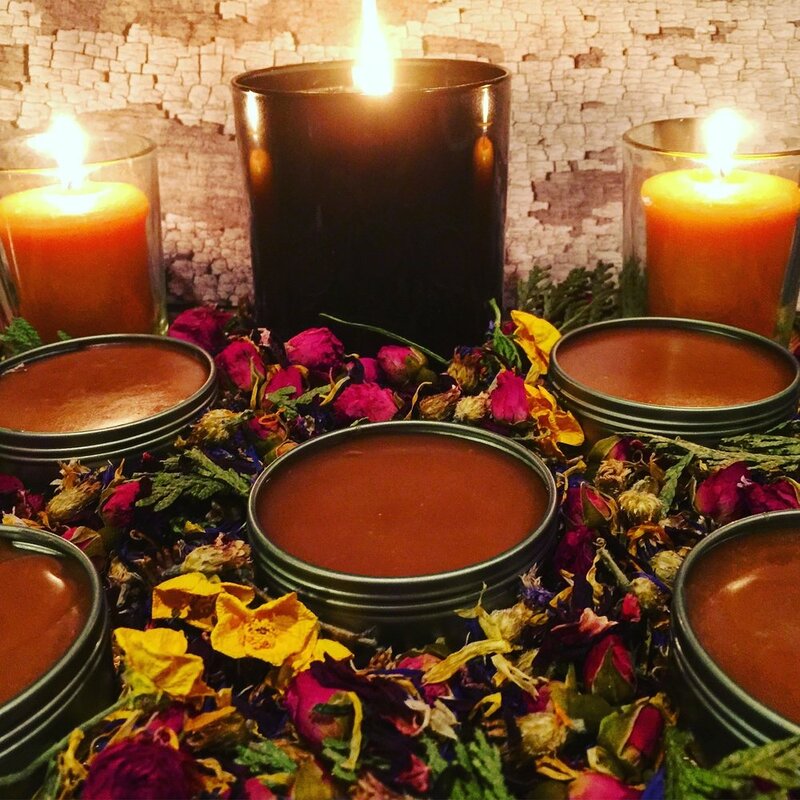 If you are going to be using herbs, making preparations, and practicing the art and science of herbalism, you'll need to make some room in your house for your precious herbs. They take up a lot more space than essential oils do. You can't just start using herbs without some kind of foundation. Well, I guess you can....but in order to do some real good for your body, you have to be willing to do the work it takes to learn about the plants, experiment with them, experience them. There is a certain amount of passion involved in learning to use herbs for your own health. 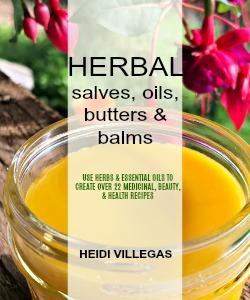 Some herbal preparations, like these salves, can be created using both herbs and essential oils for exceptional efficacy. Many essential oils can be used "neat," which means no dilution is required. Others may require some dilution in a carrier oil, but for the most part, essential oils are ready to go. Take a couple drops of one essential oil and combine it with another---so easy. There's no mess. No muss. No fuss. And creating essential oil blends is fun and simple. Since essential oils come in tiny little brown bottles, you can store literally hundreds of essential oils (ask me how I know) in a relatively small space. I've actually had people gasp at both my herb and essential oil collections. Since our nasal passages have nerves than connect directly to our limbic system, essential oils are quite powerful when it comes to balancing emotions. I love using my essential oils to help me get into a good mood or to help quickly soothe a minor little headache. Or--to stay awake when I'm driving long distances (peppermint, my friends). Herbs vs. Essential Oils? Which are better? When using essential oils, it's important to understand they are the very concentrated volatile oils from the plant, and therefore do not contain all the many chemical constituents that create a truly medicinal herb. It's like they are missing some parts that may be important. Like herbs, you have to know what you are doing with your essential oils. You can't just start slathering them all over your body (which I have seen people do). Learning and a foundation of knowledge is just as important for using essential oils as it is for using herbs. Because essential oils are so concentrated, and literally just a drop will often do just fine, they require great care and consciousness when using them. Especially when it comes to children, the elderly, pregnant women, or women who are nursing babies, and with pets---exceptional care must be taken. Small amounts of certain essential oils (like wintergreen--one of my favorites for external pain relief) can still be toxic in tiny amounts for some people. So many distributors of essential oils (mainly from the large MLM companies) espouse that using essential oils internally is perfectly safe. However, I have spoken with many aromatherapists and read tons of literature, and the vast majority state essential oils should not be used internally, as they are so very powerful, and even small amounts can damage fragile organ linings. I'm not a doctor. Nor am I an aromatherapist. However, I do like to err on the side of caution in my use of both herbs and essential oils. I think more research should be done on this topic. And one more point here: Yes, some people may say that, "Essential oils are safe to use internally because they can be found in food products." Well. Sure. SAFE essential oils in VERY tiny, minuscule amounts for flavoring may often be found in certain foods. However, these amounts are much more tiny than even a drop of essential oil that comes from one of those little brown bottles. Contrary to the common saying, "I've got an oil for that," essential oils are not useful in every instance. Sometimes you need to combine herbs with essential oils for the most suitable relief. I would much rather use an herbal antibiotic, for example, than trust a few drops of essential oil to do the job. However, I feel using essential oils in conjunction with herbs is wonderful in all kinds of situations. You can see how I've done this in this recipe for St. Johns Wort Salve and this one for Lavender Salve. More and more, we hear about the dangers of single crop farming and pillaging the land for a crop that is damaging a natural ecosystem. Anytime you have huge farms that grow only one crop, you are looking at a system that damages the environment. I'm not an expert, but I have heard a lot said about sustainability issues with the recent explosion and interest in essential oil use. Like many herbs, the volatile oils can be extracted from Thyme, which is then an essential oil. But the whole herb is so useful and powerful, too, and in a greater variety of ways. Final Reflections About the Question, "Which is Better? Herbs or Essential Oils?" Lots to think about here, right? You can probably tell: Natural health using both herbs and essential oils has been my passion for a very long time now. Yes, I've been laughed at. Gotten the "sideways" looks. Been openly rebutted. Heard snickers behind my back. I personally believe that using plant medicine is the first (and best) way to go if you can. When I talk about "plant medicine," I am referring to the use of both herbs AND essential oils. I love them both. I think they both have definite places in your natural healing and health arsenal. However, if you had to pin me down to which ONE I would choose, if I had to make a choice? I'd choose herbs. Hands down. I would choose the plants I could go out and gather myself, make myself, prepare myself, and know all about than I would plant medicine from a processing plant. That's my personal take on the question, "Which is better? Essential oils or herbs?" I hope this has helped answer at least some of your questions too. Maybe I've even created some more questions for you? If that's the case, I'd love to hear your thoughts in the comments section! Even if you disagree with me, it's a great conversation to have! Also, take a look at the second article along these lines, How (and Why) You Should Incorporate Herbs Into Your Essential Oil Practice, and Vice Versa. And--there are LOTS more over on the blog about both herbs and essential oils! "Herbs grown at home. They’re more sustainable and I don’t have anyone pushing misuse and unacceptable practices with them. There are many, many herb books that have trustworthy information in them that I can rely on. "If I had an herb garden, I'd use them first. This rampant overuse encouraged by MLMs is causing real sustainability issues. "I really can't stand the marketing and hype around essential oils, and while it's possible they're the cure to everything including cancer, it still seems like a big scam to me. Especially when MLM companies are involved. There's an incentive for them to exaggerate or lie to promote their own brand, and the MLM means that many people get in on promoting them voluntarily with promotes the same unethical behavior. Disclaimer: I am not a doctor, naturopath, or certified aromatherapist. These statements are simply my own opinions based on my personal experiences. Please be sure to seek advice from your medical professional before using any essential oils or herbs. These statements have not been evaluated by the FDA.